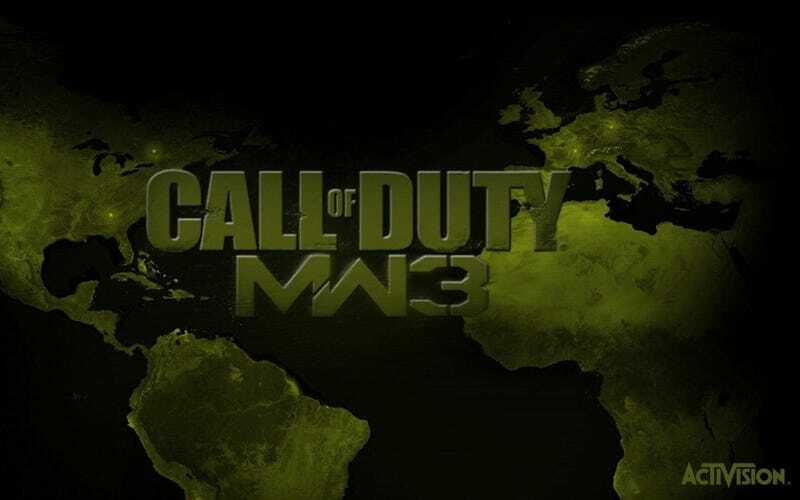 Following in the footsteps of the last three Activision military shooters, Call of Duty: Modern Warfare 3 had a record-breaking, money-printing first five days, pulling in more than $775 million in worldwide sales, Activision reports. "With $775 million of sales of Call of Duty: Modern Warfare 3 in its first five days, Call of Duty has become the first entertainment property in history to set five-day launch records for three consecutive years across all forms of entertainment," said Robert Kotick, CEO, Activision Blizzard. "Life-to-date retail sales for the Call of Duty franchise have exceeded $6 billion worldwide, which makes Call of Duty one of the most valuable entertainment properties in the world. " Modern Warfare 3's $775 million in sales is a nice jump up previous Call of Duty launches: Black Ops brought in $650 million last year and Modern Warfare 2 earned $550 million two years ago. More than 7.0 million multiplayer hours were logged playing Call of Duty: Modern Warfare 3 by the end of launch day, November 8, a 19% increase over last year's 5.9 million multiplayer hours logged playing Call of Duty: Black Ops last year's launch day.